The best episodes of Psych throw all the main characters together in such a way that they have to bounce off each other constantly, creating the trademark witty banter that leads to the best humor the show is capable of. Not tonight, when basically all of the characters split up into different locations, interacting too often through phone calls or on their own, which is why I find myself disappointed by “The Tao of Gus”. Shawn and Gus are at the commune, but mostly separated since Gus is smitten with another girl we know will be shunted off in some unexpected way during the last five minutes, leaving Shawn to do his sleuthing alone or over the phone with Juliet or his father. I understand that Shawn and Gus go off and do their own thing away from the Santa Barbara police all the time, but then at least they’re bickering with each other. My problem tonight was that with Gus distracted again by his romantic interests, Shawn was left to create humor on his own, which just doesn’t work for me most of the time. A woman named Nicole reports a murder to Juliet and Lassiter, but they don’t really believe her, considering she says it happened in broad daylight in an alley off a busy street, but mostly because she’s doing a bunch of meditative stuff and generally acting like a hippie. Gus falls for her instantly, and forces Shawn to help him “protect” Nicole. After they try to have her stay at Juliet’s, they head out to take her home, only to find out that she lives in a commune, which seemed like a very watered-down group of generic hippies. When Juliet puts on a scarf that Nicole accidentally leaves behind, someone starts shooting at her in her own apartment, and the potential danger is confirmed. As the case unfolds, Henry figures out that the guy Nicole claims she saw murdered was a police officer with Internal Affairs, which led to a great scene with the head of IA, Juliet, and Lassiter. Carlton, of course, hates IA, as all hardened police officers do. This all played out in the typical solve-by-numbers formula Psych has well established, and I’m perfectly happy to go along with each week. All I ask is for some decent laughs, which didn’t materialize very often. Normally I’m a fan of Gus going head-over-heels for a random girl that leads to a case, but considering this is the same type of premise the show used in the Hangover themed episode at the beginning of the season, the retread felt very repetitive. Dule Hill always does a pretty good job of making me laugh with his over-the top antics, and his commitment to the commune activities as a means of wooing Nicole nicely fit the bill. What was missing from the Hangover episode was the conversation he had with Shawn when they spend their first night at the commune. Shawn has a steady relationship with Juliet – though just how solid that relationship may be is up for debate, he’s not treating her that well. Gus doesn’t have something like that in his life, so he’s sending out stronger signals that he normally would. It was a nice moment of real honesty, where the layers of sarcasm and infighting died away just for a second to show that Gus isn’t as satisfied with his life as Shawn. Most of the time, I really enjoy the way that Psych uses its guest stars. William Shatner, Danny Glover, and Molly Ringwald have all come through the show this season in supporting roles that didn’t conform to the typical “highest profile guest star is the crook” crutch, which it employed tonight. Carlos Jacott from the Firefly pilot popped up – at least I’m fairly sure that was him – but the bigger name was Diedrich Bader as Eli, the leader of the commune, who is totally not a cult leader deceiving a lot of wealthy people out of their assets. With two guest stars I recognized, it was pretty easy to see that one would be the red herring, and the other would be the culprit, and once the episode started dropping easily digested hints that Nicole, Jeff, and other commune members had been wealthy before giving up that life to join the community, it was apparent that someone was embezzling money, and the easy choice for the criminal was Eli. Seeing Lassiter and Juliet on the commune offered some nice moments, and Lassiter’s tirades against hippie culture were right in line with his uptight conservatism that I find very funny, but the nonspecific aspects of the hippie commune didn’t lead to many funny scenarios. There’s a random run-in with locals that has Shawn citing Footloose, Lassiter assuming everyone is smoking pot all the time, and a scene in The Barn of Truth with a Gourd of Transparency that works remarkably similar to the Feelings Stick on New Girl and is equally lame. 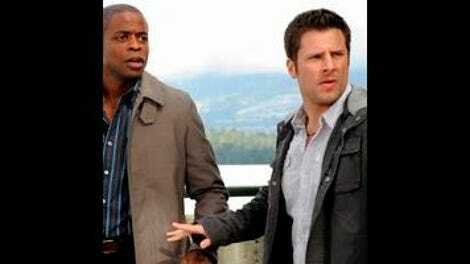 Psych telegraphs its moves in almost every episode, it’s dependable that way, but that usually also applies to the main characters working together through a lot of funny exchanges. “The Tao of Gus” didn’t come through on that part of the bargain tonight. We got the longer version of the opening credits tonight, which is fine, but it’s not my favorite theme song. RIP Terriers. Shawn thinks all fruits are just different sized apples. I’ve recently seen Martha Marcy May Marlene and Milos Forman’s film adaptation of Hair, which were both on my mind watching this episode, on the cult and hippie fronts.